Dearborn museum officials call on Mayor O'Reilly to undo the firing of a magazine editor who wrote on Henry Ford's anti-Semitic history. 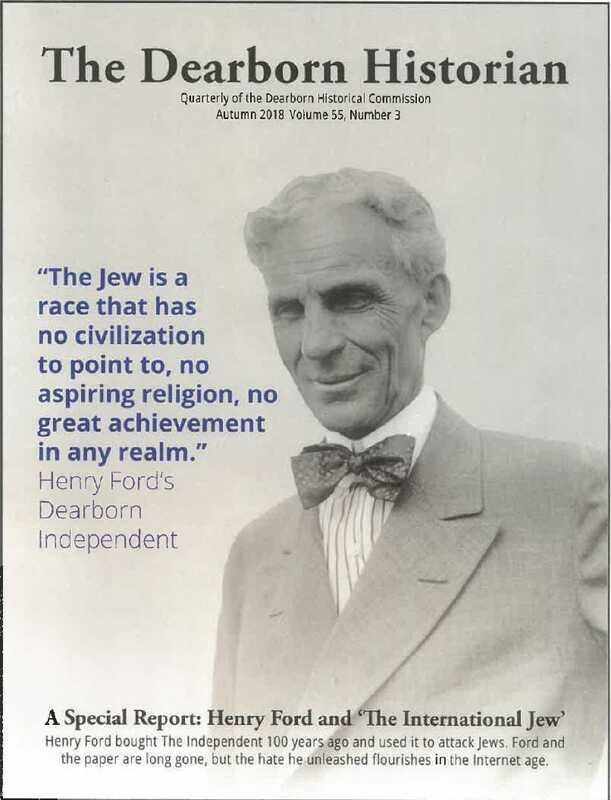 Dearborn — The Dearborn Historical Museum Commission is calling on the city mayor to rescind his firing of the editor of the group's historical magazine after he reported on Henry Ford's history of anti-Semitism in the publication's 100th anniversary issue. Museum officials say Dearborn Mayor John “Jack” O’Reilly Jr. ordered the firing of magazine editor Bill McGraw Wednesday after he saw the January cover of the Dearborn Historian. The city-funded quarterly magazine focused on the centennial anniversary of Ford buying the Dearborn Independent, a weekly newspaper that Ford oversaw and infamously used to spread anti-Semitic views, said Andrew Kercher, assistant chief curator of the museum. Kercher said O'Reilly got involved and ordered acting chief curator Jack Tate to terminate their contract with McGraw. In a Feb. 7 letter to the subscribers of "The Dearborn Historian," O'Reilly said he did not fire McGraw. Kercher said there were concerns by the publication board about the cover, which had a black and white photo of Ford with a quote reading, "The Jew is a race that has no civilization to point to, no aspiring religion, no great achievement in any realm." "The cover itself was provocative," Kercher said. "The quote was published in a previous version of the Independent, but wasn't directly attributed by (Ford) but he did oversee it. It was a little misleading but still accurate." The 28-page issue was never sent out to its 200 subscribers as planned in January. "Henry Ford is obviously Dearborn's favorite son," Kercher said. "This wasn’t just to sling mud or done irresponsibly. This is basically a form of censorship and crazy to fire the editor and withhold the information from the public." McGraw, a veteran Detroit journalist, worked part-time as the editor of the magazine and the January issue would have been the second he oversaw. He also works as a contributor with Deadline Detroit, which published the 10-page story. On Friday, McGraw told The Detroit News the situation was unfortunate and the story would have been positive for Dearborn. "Dearborn as a city has branded itself with Henry Ford from the seal to the museums," McGraw said. "I think given what’s going on in the world today with the rise of anti-Semitism, what happened to Pittsburgh in October and with the 100-year anniversary of the paper last week, it's important to know that's still playing a huge role online with extremists. It seems if Dearborn is going to be proud of Henry Ford, we should look at the whole picture," he said. The former editor said he, as a Dearborn resident for the past 30 years, thinks O'Reilly is a great mayor but that his actions drew attention to a story not many people would have noticed otherwise. "I haven't heard from the mayor at all, but I think he's a great mayor. Dearborn is a great community, and he provides a calm presence," McGraw said. "I'm proud of Dearborn, and had this just been published, it would have been a positive thing for the city." The museum commission held an emergency historical commission meeting Thursday evening where Kercher said members passed a resolution calling on O'Reilly to undo his dismissal of McGraw. "It's not really mudslinging magazine. This wasn’t some attempt to stir the pot," he said. "It was on the anniversary, on a relevant topic. ... History is history. We don't have to sugarcoat it, and I really don’t know why the mayor wanted it to be hidden."